Pastor Paul Warneke has been pastor at Zion since February of 2010. Prior to his call to Zion, he had been serving as pastor at St. John’s Lutheran Church in Curtis, Nebraska for nearly 14 years. He received his Master of Divinity degree from Concordia Theological Seminary in Fort Wayne, Indiana in 1996, and his Bachelor of Arts degree from Concordia, Seward in 1983. 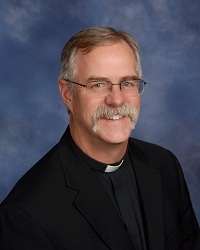 Born and raised in Torrance, California, Pastor Warneke attended Ascension Lutheran Church and School (where his father, Lloyd, was pastor), and Lutheran High School, Los Angeles. The family moved to Montana his senior year of High School and he graduated from Billings Senior in 1977. Pastor met his wife, Randi (Hill) in college, and they were married in the summer of 1983 at Tabor Lutheran Church in Chicago. They have five children, Ames (Smallfoot), Joe, Marty, Chris, and Daniel; and two grandchild, Austin and Abel. Randi works as a Social Worker for the Veteran’s Administration in Grand Island. Her Master’s Degree in Social Work, which she earned at California State University, Long Beach in 1991, helped put Pastor through seminary as she worked various social work jobs around the Fort Wayne area. Pastor Warneke was recently re-elected Circuit Visitor of the Hastings Circuit, a position he held for many years in the McCook Circuit as well.